This was stated by the LPC Port Manager, Mr Nasir Anas Mohammed while receiving the Controller Immigration Service in-charge of Lagos Seaports/Marine Command Mrs. TFA Olayemi who visited him on courtesy call. Mohammed, while interacting with the Immigration boss, informed her that with the Apapa Port serving as an important economic facility for the nation, it was necessary that a forum is provided for heads of security and other government regulatory bodies operating in the port to meet regularly and discuss security and other important issues for the overall interest of the port in particular and the nation at large. Heads of agencies that will be attending the meeting, he said, will include those of the Nigeria Customs Service, Nigeria Immigration Service, Police, Department of State Security, National Drug Law Enforcement Agency (NDLEA), Nigerian Maritime Administration and Safety Agency (NIMASA) and the military. While further assuring continuous support to the Immigration boss, the Port Manager also discussed that the port has been concerned over reports that some security personnel operating from land and water side have been extorting port users, an act which he said has continued to give the port a bad name. Anas therefore requested the Controller to fish out and deal with such bad eggs that may exist in her department; especially since immigration personnel deal with captains and sailors who bring vessels to the port. Some heads of departments who were with the Port Manager at the occasion include Engr. S. Ajibola the Chief Port Engineer, Mrs. Irene Ndolisa Head of Public Affairs and Mr Mcluke Iwuoha, Port Security Officer. Earlier, Mrs Olayemi had informed the Port Manager that the purpose of her visit was to thank the port management for his support and assistance. She particularly appreciated the office recently renovated by the port for her staff, saying the gesture has gone a long way to improve their productivity. The immigration boss also briefed the Port Manager regarding the procedure when handling stowaways found on vessels and solicited the port to provide her department with adequate screening facility required to temporarily hold such persons pending their repatriation. 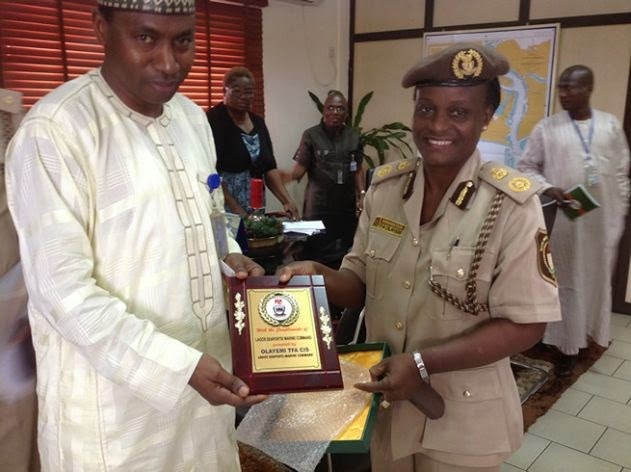 The immigration boss who was accompanied on the visit by some of her officers also presented the Port Manager with a plaque to commemorate the visit.